All of us have things that we take seriously, but even the best of us can get carried away at times. Maybe your local rival happens to be in your neighborhood video game shop for game night, or a colleague starts competing with you to finish the project you've been working on for months, but no matter the case, it's one where you're too invested to let go without a fight. In times like these, we find our normally healthy level of investment take on fervid proportions. Fervid illustrates that something exhibits a great, oftentimes excessive amount of energy or investment in something. To be fervid is to be more than merely enthusiastic, but outright fanatical in one's involvement in or excitement for a thing. An avid fan of classical literature might have a copy of all the great Greek tragedies, but a fervid one would likely have multiple copies, each a different translation (or even in the original Greek)! No matter what one may have a fervid attachment to, their energy for it is nearly boundless. The word fervid also means literally hot or burning. 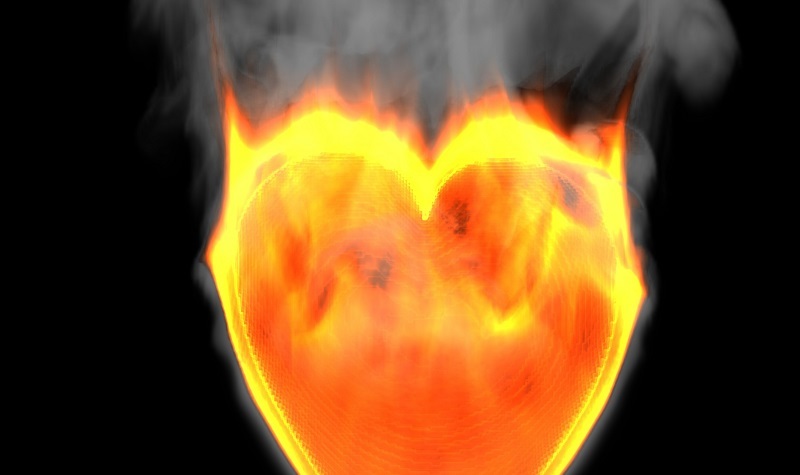 Since the primary sense is concerned with passion, it is only fitting that its secondary sense relates to fire, as particularly great passion is often described as "burning" or "fiery" in nature. Though fervid in this sense is generally used in regards to actual flames or heat, it can also occasionally extend to metaphorical warmth or fire. Example: The firm's top accountant had a fervid fascination with numbers. Example: The fireplace's fervid flames not only kept the family's living room warm, but also seasonally decorated. While what is now the secondary sense of fervid, meaning "fiery" or "hot," emerged in the late 16th century, its figurative understanding of "zealous" or "passionate" did not appear in English until midway into the next century. Prior to its English incarnation, fervid took the form of the Latin word fervidus, meaning both "burning" and "vehement." This term derived from the Latin verb fervere, meaning "to boil" or "to glow." Fervor: This noun is the root word for fervid, and means the quality of excessive passion for something. Example: His fervor for his point of view made him a formidable debate opponent. Fervent: Fervent is an additional adjective derivative of fervor and, like fervid, describes a quality of zealous investment in something. Example: She made a point to tone down the fervent sense of competition she reserved for tournaments when attending her friends' casual game night. Fervidly: The adverb form of fervid denotes when an action is being executed in a fanatical way. Example: Convinced of her product's innovative genius, she fervidly lobbied for prospective investors' support. Why, I ask, can I not finish the letter that I am writing? For my room is always scattered with unfinished letters. I begin to suspect, when I am with you, that I am among the most gifted of men. I am filled with the delight of youth, with potency, with the sense of what is to come. Blundering, but fervid, I see myself buzzing round flowers, humming down scarlet cups, making blue funnels resound with my prodigious booming. How richly I shall enjoy my youth (you make me feel). Here, Woolf's narrator expresses the ecstasy that his partner inspires in him. Particularly, he notes that even when he goes about the most mundane or whimsical of activities, though he is somewhat aimless he is also impassioned, or fervid, with the love he feels for his partner and them for him. If you are a fervid fan, you are an avid one. If you are a fervid fan of Fergie, you think she's Fergalicious. Bring out the linguist in you! What is your own interpretation of fervid. Did you use fervid in a game? Provide an example sentence or a literary quote.